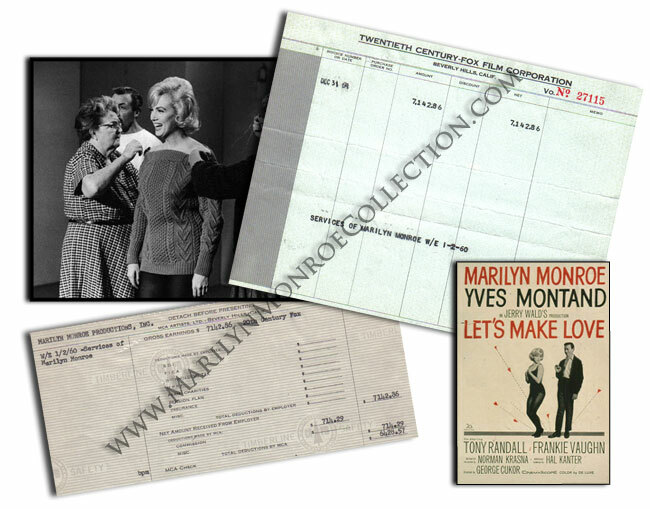 Marilyn Monroe's Personal Payment Documents for "Let's Make Love"
This Cinemascope musical comedy scripted by Norman Krasna as The Billionaire was brought to Marilyn by producer Jerry Wald as Fox stepped up the pressure for her to honor her studio commitments. In 1955 she had agreed to do four films for Fox, but before Let’s Make Love went into production she had only done Bus Stop (1956). Initially Billy wilder was a front runner for the director’s chair. Apparently he was willing to try again after the harrowing experience of working together on Some Like It Hot, but he already was contracted to do The Apartment. George Cukor was summoned as his replacement. He too had difficulties with Marilyn, and reputedly did a great deal of his communication through choreographer Jack Cole. Marilyn’s reputation made it next to impossible to find a male lead for this movie, a character rumored to be closely modeled after Howard Hughes. Before Yves Montand was offered the role, it was turned down by a “who’s who” of Hollywood’s headliners: Yul Brenner, Cary Grant, Rock Hudson, Charlton Heston, William Holden, Gregory Peck, and James Stewart. It was Marilyn who suggested Montand; the studio was not happy, but she insisted, and Marilyn got her man, in more ways than one. Their very public love affair spelled the beginning of the end of Marilyn’s marriage to Arthur Miller, and came close to unraveling Montand’s union with Simone Signoret. The biggest delays during filming were not due to Marilyn’s lateness or illness, they were because of a strike by actors to preserve residual payments. The Writers Guild came out in support too, though this was precisely at the time when Arthur was doing the rewrites. Marilyn sang four songs for the film: “My Heart Belongs to Daddy” by Cole Porter, and “Let’s Make Love,” “Incurably Romantic,” and “Specialization” by Sammy Cahn and James Van Heusen. Marilyn’s rendition of “My Heart Belongs to Daddy” is remarkable for the effortlessness of her performance, the result of at least two weeks of rehearsal. The movie bombed. Critical write-ups were almost all scathing, and the public stayed away. Inside Hollywood, gossip circulated that Marilyn’s star was on the wane. Outside America, the film was renamed The Millionaire. To get news and updates from The Marilyn Monroe Collection, CLICK HERE!